Storybook characters are brought to life with puppets designed after the illustrations in picture books. 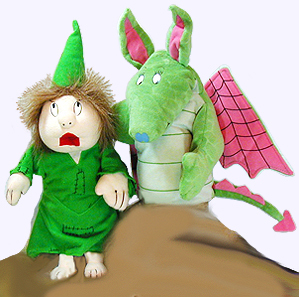 Children of all ages will enjoy following their favorite stories and enacting the scenes with storybook character hand puppets. Links to other puppets are below. 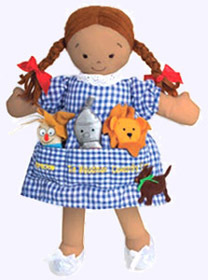 Pockets sewn into Dorothy's dress hold The Scarecrow, The Tin Woodman and The Cowardly Lion finger puppets. These stowaway removeable mini-puppet storybook friends bring this fairy tale to life. Adorable Dorothy is 14" tall and she wears a cotton print dress. 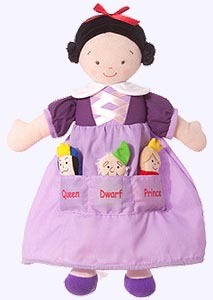 Pockets sewn into Snow White's dress hold a Dwarf, a Prince and The Queen finger puppets. These stowaway removeable mini-puppet storybook friends bring this fairy tale to life. Adorable Snow White is 14" tall and she wears a lavender cotton dress. 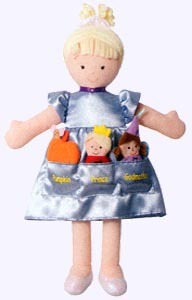 Pockets sewn into Cinderella's dress hold a Pumpkin, The Prince, and The Godmother finger puppets. These stowaway removeable mini-puppet storybook friends bring this fairy tale to life. Adorable Cinderella is 14" tall wearing her pink cotton dress. Cute as she can be, Cinderella is 14" tall, wearing her blue sateen dress. 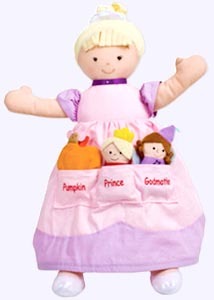 Pockets sewn into Cinderella's dress hold a Pumpkin, The Prince, and The Godmother finger puppets. These removeable mini-puppet storybook friends add life to this classic fairy tale. 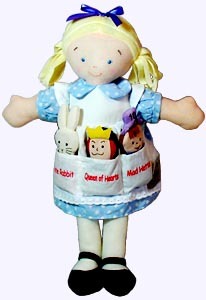 Pockets sewn into Alice's dress hold The White Rabbit, The Queen of Hearts, and The Mad Hatter finger puppets. These stowaway removeable mini-puppet storybook friends bring this fairy tale to life. Adorable Alice is 14" tall and she wears a cotton print dress. The Cheshire Cat is sewn on beside the Mad Hatter Pocket. 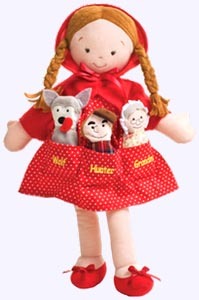 Pockets sewn into Little Red Riding Hood's dress hold The Big Bad Wolf, The Hunter, and Grandma finger puppets. These stowaway removeable mini-puppet storybook friends bring this fairy tale to life. Adorable Little Red Riding Hood is 14" tall and she wears a cotton print dress. 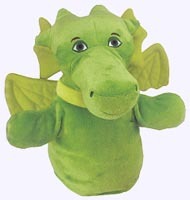 Bring the story of the Pricess and the Dragon to life with these adorable hand puppets. Puppets are 11" tall. 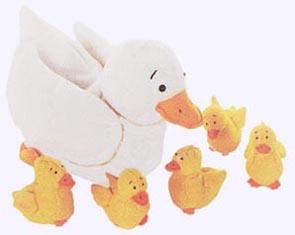 Beautifully made Mother Duck hand puppet and five little duckling finger puppets complete this set which is designed to accompany the Five Little Ducks Book. Children bring the story to life by enacting events in the book. A plump Mother Duck is 9" long and the Little Ducks are 3" long. 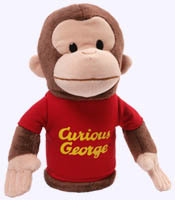 Children will be ready for showtime with this 10" Curious George stage puppet. 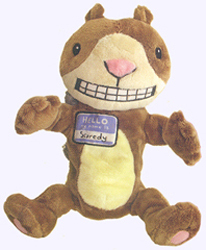 From M�lanie Watt's zaney series this 12" puppet will soon be your best friend. 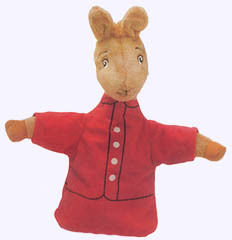 Llama Llama puppet is 12" high and is a great way to animate the storys of Llama Llama. 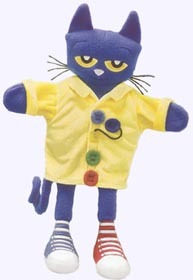 From the book Pete the Cat and His Four Groovy Buttons this 14.5" puppet is ready for a child to animate the story. Hand Puff Puppet is 10" tall. All Ages. 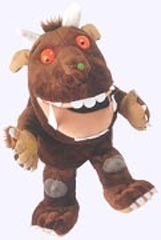 Enact your own story of the mouse and Gruffalo with this 12" hand puppet. 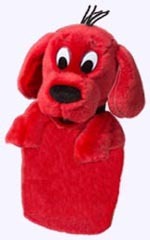 Clifford the Big Red Dog Hand Puppet is 11" tall. 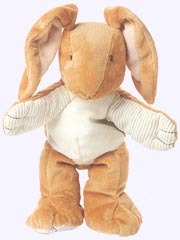 Nutbrown Hare Puppet is 11" tall and is surface washable. From Linda Kranz's inspirational gift book, this brightly colored 8" fish puppet is surface washable.